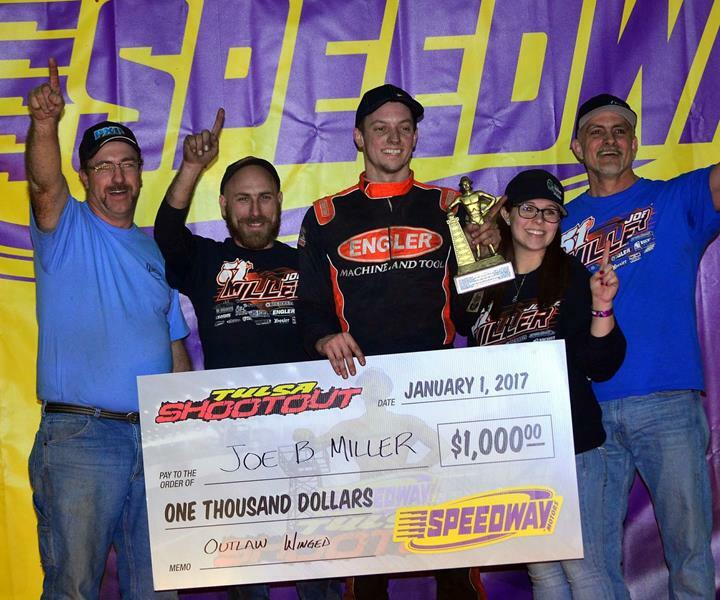 2017 Tulsa Shootout results are topped by Joe B Miller who came from last to first to win the Outlaw class. TULSA, Okla. (January 1, 2017) If there was ever a way to start the year, the finale of the 32nd Speedway Motors Tulsa Shootout just set the bar as Missouri’s Joe B. Miller laid waste to the field of the 55 lap Outlaw feature event with a run from the final starting spot to win the coveted Golden Driller in the night’s championship Outlaw event. Adding a cherry on top, the win is Miller’s first in Speedway Motors Tulsa Shootout competition. With Oklahoma’s Christopher Bell taking the early lead, the native of Norman looked to have the win in hand until Washington’s Gary Taylor raced by on Lap 32. Through cautions and attrition that allowed the field to regroup, Miller moved into fifth on Lap 36. Using restarts to his advantage in the closing laps, the runner-up spot came with 10 laps to run and traffic on the horizon. Holding up Taylor, the No. 151 began closing and with time looking to expire, the caution flew for Frank Flud whose night ended while running fourth. With a lapped car in the lineup on the restart, Taylor set sail but one more caution was in store as Christopher Bell and Cory Eliason flipped violently into the first turn while racing for third. Both drivers were okay. Restarting with three laps to run, the lapped car out of the mix, Miller went to work. Running the cushion of turns one and two on the restart, the slide job came in the next two turns. Nearly even with Taylor at the line, Miller pulled to the lead with two rotations remaining. Setting into the final turns, Taylor would set up for the run, but Miller would not be denied his golden prize. While Joe B. Miller grabbed the win in the night’s biggest race, eight other divisions saw action as well with an overall eight first time winners. Starting off A-Features with 1,200cc Non-Wing Mini Sprints, California’s Thomas Meseraull claimed his first career Golden Driller. Earning the pole of the night’s 20 lap A-Feature, Meseraull swapped the race lead with Mitchell Davis the first couple of laps before taking the point on Lap 4. Challenge again near the race’s midpoint, “T-Mez” would hold on. Second A-Feature of the night was the Stock Non-Wing division. Going 25 laps the opening rounds were in the hands of Indiana’s Zeb Wise. Advancing from third to second on the start, Oklahoma’s Frank Flud was quick to challenge the leader with the point going to his control on the fifth trip around the Tulsa Expo Raceway. From there, laps clicked by with ease as Flud claimed his fourth career Golden Driller since 2014, and second in Stock Non-Wing competition. Junior Sprints appeared third in the lineup with an all California front row. Chasing through the first two starts, Caeden Steele played the hunter as Garth Kasiner led the field. Pacing patiently around the hub of the track, Steele moved in for the challenge on Lap 10. Denied the position down the back stretch, the No. 121 secured the top-spot off the next set to turns to lead the remaining laps. Fourth feature to the racing surface was the Outlaw Non-Wing division as Tristan Guardino from Fremont, Cali. picked up his first career Golden Driller after a spirited battle with Indiana’s Cole Bodine. Never letting Guardino get out of reach, Bodine was all over Guardino following a late race restart. Mounting a charge off the final turn, Bodine would come up 0.146 seconds shy of picked off the win. 1,200cc Winged Mini-Sprints saw Pennsylvania’s Tyler Walton in Victory Lane. Battling early with Thomas Meseraull who led the opening two laps, Walton took over on Lap 3 and never relinquished the point through several attempts by Meseraull for the lead on restarts. A-Class saw a dominating performance by Ayrton Gennetten. Taking off from the pole, the Missouri native out ran Indiana’s Tyler Courtney into the first two turns and simply pulled away from the field. Through cautions and lapped traffic, the closest anyone got to challenge was Frank Flud who closed the gap from a straight-a-away to 0.441 at the checkered flag. ECOtec competition saw the first different winner since 2014 with Oklahoma’s Ty Hulsey. To the lead from the pole, Hulsey kept pace ahead of the hard charging Adam Pierson. Taking one shot at the lead, the Vermont driver was never able to edge ahead. Restricted competition went to Oklahoma’s Grady Mercer. Leading every lap of the A-Feature, Mercer’s advantage nearly always returned to just shy of a straight-a-way after any caution. With the close of the 32nd Speedway Motors Tulsa Shootout, 1,068 entries were received for the 2017 edition with drivers coming from 35 states as well as Australia and Canada. Overall, Golden Drillers went to California, Missouri, Oklahoma, and Pennsylvania. Dates for the 2018 event will be released in the next month. The next event at the Tulsa Expo Raceway, located inside the River Spirit Expo Center, is the 31st Lucas Oil Chili Bowl Nationals presented by General Tire, happening January 10-14, 2017. B Feature 4 (12 Laps): 1. 34-Kj Snow; 2. 12K-Frank Galusha; 3. 48T-Tanner Holm; 4. 29L-Nate Lauderbaugh; 5. 93M-Mathew Riggs-Carr; 6. 7S-Skylar Hunter; 7. 91K-Kevin Bayer; 8. 321-Chad Winfrey; 9. 1M-Steven Shebester; 10. 46G-Brian Grogan; 11. 71B-Chase Briscoe; 12. 88K-Koen Shaw; 13. 22J-Keith Day; 14. (DNF) 22C-John Campbell Sr.
B Feature 7 (12 Laps): 1. 8-Scott Sawyer; 2. 1F-Jason Friesen; 3. 15L-Michael Laughton; 4. 98P-Miles Paulus; 5. 44-Ben Worth; 6. 20W-Gabe Wilson; 7. 29R-Ryan Ratliff; 8. 23M-Rhea Lynn Moss; 9. 10E-Matt Ebarb; 10. 08-Cory Grenzy; 11. 8L-Brian Lunsford; 12. 15-Jase Randolph; 13. (DNF) 11X-Tom Curran; 14. (DNF) 28P-Randy Wagnon, Jr.